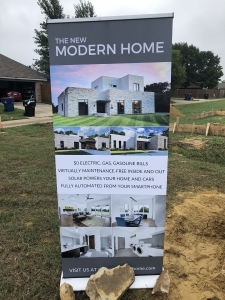 FRISCO (WBAP/KLIF News) – Frisco has officially begun construction on the city’s first “Modern Home” neighborhood. The idea is to create fully energy-sufficient homes, giving homeowners the potential to wipe out their energy bills. Mayor Jeff Cheney said it’s just another example of the city embracing innovation. “That’s the brand that Frisco is trying to create for itself. We want to be on the leading edge of everything from technology to transportation to new home construction,” he said. The builders are touting the homes’ design as being easier on the eyes than similar energy-efficient builds. “Their solar panels hidden under the roof…so you won’t see them. There won’t be the eye sores that you typically see with solar panels,” said Cheney. Both Cheney and the builders are expecting the homes to become more popular across the city once construction is complete. It’s the first neighborhood of its kind in the country.